U.S. manufacturers had another solid quarter of profits from April to June, according to data released today by the Census Bureau. The total after-tax profits for American manufacturing corporations totaled more than $149 billion in the second quarter, a slight increase from $148.2 billion in the first quarter of 2012, but down slightly from the all-time quarterly high of $153.4 billion of profits in the second quarter of 2011 (see chart above). Manufacturing profits have ranged between $146 billion and $153 billion over the last six quarters starting at the beginning of 2011, which contributed to record-setting profits in 2011 on an annual basis of almost $600 billion. Based on the first two quarters of this year, manufacturing profits are on track to approach $600 billion again this year. In the three years before the recession started (2005-2007), manufacturing profits were averaging about $110.0 billion per quarter, so the recent average of $148.5 billion per quarter since 2011 puts current manufacturing profits 35% above pre-recession levels. 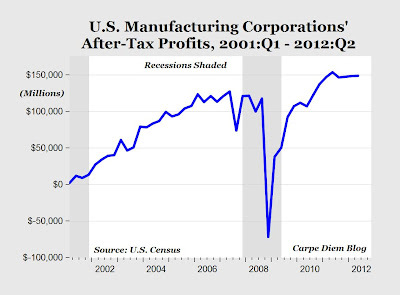 This provides evidence of an industry that has not only made a complete recovery from the 2007-2009 recession, but shows that U.S. manufacturers as a group are now actually significantly more profitable than before the recession. So what do you do with the profits? The outlook for robust growth (domestically and internationally) isn't very strong, and on Jan 1 taxes on dividends go up dramatically. Oil. Lots of oil. Bountiful light sweet crude. That's the thing, Scott. Most of these guys are just sitting on their profits. The last two years, there was heavy investment in new equipment (although that has tapered off recently). One thing businesses learned well during the last recession was that cash is king (as cliche as that may be). With much of the political discussion over the past two years passing from crisis to crisis (debt ceiling, fiscal cliff, Health Care, international trade), many businesses don't really know what to expect. Much of the improvement we've seen over the past two years, I think, was more demand driven than anything else. One of the things I fear should Romney be elected is more indecision. At least with Obama in charge, you know what to expect. I fear that, should he get elected, Romney would tear down some of the rules Obama put into place and throw a monkey wrench into the plans of companies who are adjusting to the new rules. it's an interesting question. one of the key answers is product development. many of the companies classified as "manufacturers" are nothing of the sort. they may tick "manufacturer" on an sec box, but they don't actually build anyhting. apple is a prime example. they do not manufacture anyhting in commercial quantities. these "platform" companies have been very successful. instead of needing to build plants, they just rev products and software. they also hoard cash. ironically, they do it because that is best for shareholders. cap gains are taxed at less than dividends. assuming investors use an enterprise value model, it's better to keep the cash. imagine a company with a business worth $10 a share. they earn $1 in eps. if they keep it themselves, the stock goes to $11. if they give it to the investors, the stock stays at $10. investors pay NO tax on the move to 11 or their marginal rate to get the dividend. even if they need that cash and sell the stock, they pay only the cap gains rate. as a result of our tax code, we get cash hoarding. it's the efficient response to bad policy around double taxation. the cap gains cuts under reagan and the gingrich congress sparked huge investment booms. we do not have an example of what happens when they get hiked (as they will next year when they jump by about 67%) but i suspect that it will harm investment quite a a bit. i am urging private companies with whom i am involved to sell now so investors can get the lower rate. a 10% hike in cap gains will be a nasty drag on profits if they sell next year. "Based on the first two quarters of this year, manufacturing profits are on track to approach $600 billion again this year." The profits from manufacturing would then be greater than the GDPs of 204 countries. Much of the profits are a result of foreign sales, and kept out of the U.S. as a result of shortsighted corporate tax policy. Private sector wages never fell during the recession. In fact, private sector wages are now 10.8% above the pre-recession level (assuming a Dec 2007 start to the recession). BLS Wage Data: Average Hourly Earnings on private nonfarm payrolls in the US, seasonally adjusted. Do those numbers include benefits? Good question, Steve. No, these numbers are solely a private sector worker's hourly salary excluding benefits. what does "hold on to profits" really mean? I would think it's not put in a virtual mattress ...right? it's go to go somewhere where it is used ..invested...right? you would think that record profits would almost have to mean - more investment because just holding on to the money is ultimately counterproductive. are companies paying stock dividends roughly in line with the record profits or are the corps keeping the money? In theory, yes. But that is not happening right now. There has been some investment, sure, but a lot of companies are just stowing that money in the bank. Literally. most retained profits are held in the form of short term paper. the goal is risk avoidance, not return. mostly, it's money market style accounts. yields at the moment are essentially zero. to hold longer term bonds with the current pricing is nothing like risk free. you'd see it if it were happening as well as instruments with duration over a year cannot be called cash and get booked as long term assets. companies are loaded up on the 3 month and under bills and CD's. the banks then arb it with rates on fed deposits etc. it really is as close to unused as you can get. Jon says: "Private sector wages are now 10.8% above the pre-recession level." Yes, but how big is the private sector compared to the pre-recession level? What's the increase in aggregate real profits compared to aggregate real wages? Scott Drum says: "So what do you do with the profits?" How about stock buybacks in a stock market crash? Something I wonder about when I see an article (and associated comments) like this, is when you're presenting dollar figures, do they take into account that the US dollar has lost so much value? In ~2007 gold was ~$600/oz, now it is ~$1800/oz (London). Also I was reading the "about" page at the Dow-Jones Industrial Average website, and an important point they made was that in 2008 something happened to one of their coefficients that forced a substantial over-valuation of the component stocks. This also means that stock performance histories pre-2008 & post 2008 can't be meaningfully compared (yet I suspect people still think they can). "Good question, Steve. No, these numbers are solely a private sector worker's hourly salary excluding benefits." "tell me when the workers earnings are 35% above pre-recession levels; then ill be impressed..."
Tell me when their value to employers is 35% higher and I'll tell you when their earnings are 35% higher. "The chart on page 21 shows there's an inverse relationship between corporate profits and compensation:"
Capital investment must be responsible for those higher corp profits. Something isn't right with those numbers, besides not doing an apples to apples inflation adjusted comparison. The huge majority of the relative job growth is not in jobs that pay $19 or more per hour. Source: the same BLS that severely understates cost increases in rent, etc. It is an average, so one person adding a job with earnings in the millions could skew the results upward. If there were 100 workers in 2007 and 90 workers in 2012, who earn 10% more, then wages fell 1%. Ron, investment is down and labor productivity is up. Bart says: "The same BLS that severely understates cost increases in rent, etc." In the case of rent, how many renters still pay the same rent, year after year? And with lower mortgage rates and refinancing, monthly payments can be much lower. Fair enough, but considering the large amount of relative growth in lower paying jobs, I just can't make it come out to where it warms the cockles of my heart. Also, as far as the 10.8% jump in private sector wages, even the bogus CPI-U has gone up 8.9% (CPPI - 16.5%). Real wages have stagnated since the 1990's. Everyone knows that story, so I didn't bother to repeat it. Besides, RJS' original challenge was to the non-adjusted manufacturing profits. To keep things similar, I didn't adjust the hourly earnings. Given the economic slump, it is too long to consider this inconsistency as mere "uncertainty". The only reasonable explanation is sustained political action against prosperity with the purpose of removing politicians that do not sufficiently pander to businesses. Shame there isn't a PATCO event for capital - where the strike is not only broken but the ability to strike is diminished. It would remove the entitlement mentality from business in a similar way that PATCO did for workers over the last 30 years. The only thing shortsighted about US tax policy is - at most - not doing more than accepting Rubik tax deals for the existing evasions of today. Although I am willing to argue that if hourly earnings had fallen, then the economic recession would not have been as severe as it was and the labor market would not have remained as pedestrian as it has over the past few years. How about just increasing the scope of collection instead of increasing the rate that is to be collected? In addition, how about something that holds people to their promises of prosperity when taxes are cut? The problem is that investment is down - for political reasons, not financial ones. If unencumbered by things like the worker freedom(as defined by the worker, not the business), labor productivity would skyrocket. "The only reasonable explanation is sustained political action against prosperity with the purpose of removing politicians that do not sufficiently pander to businesses." wow. now that is a deep drive into tinfoil hat territory. so, you are arguing that businesses are willingly forgoing growth and profits while at the same time keeping hourly wages up in order to affect an election and that this coalition of employers is so monolithic that others are not swooping in to take advantage of the opportunities forgone by others? wow. not even the illuminati could dream of such nefarious reach and power. i would posit that there is a much simpler and more plausible explanation. political meddling in the economy has crowded out private investment through stimulus and further halted such investment and expansion through regulatory growth, regulatory uncertainty, impending tax increases, and labor laws. when businesses are uncertain, they hold off on growth. it's not some conspiracy. it's just the rational response to being put in a bad situation. the exact same thing happened under fdr. only someone who has never been in business would ever think that businesses would cooperate like that as opposed to compete and fail to understand that uncertainty breeds inaction. wow seth, this one was out there even for you. "How about just increasing the scope of collection instead of increasing the rate that is to be collected? " however, you are likely on to somehting. let's absolutely increase the scope of taxes. in the 80's, 15% of individuals paid no federal income tax. now it's near 50%. let's get that 35% paying again. absolutely. let's get everyone paying. nothing fails faster than a democracy where 50% pay no tax. every new tranch of spending sounds like free stuff to them. debt? who cares? someone else will pay. let's get everyone some skin in the game. this is an order of magnitude bigger deal than anyhting corporate. 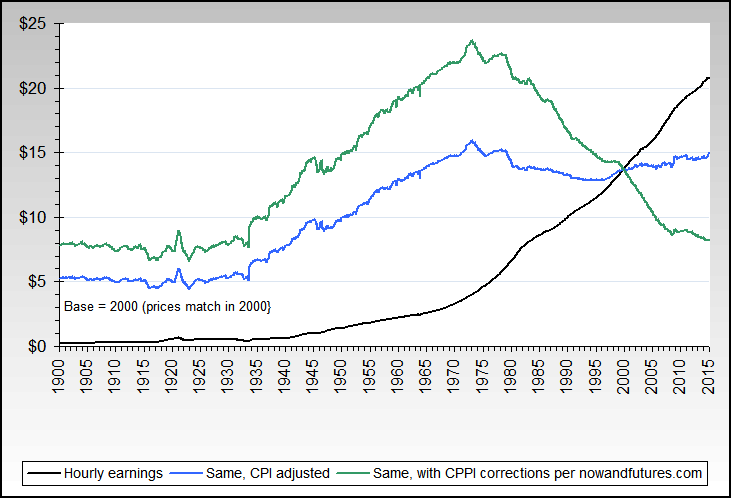 Just using CPI-U alone, they have stagnated since the early 1970s, and have actually dropped. True, but I submit that when comparing dollar based numbers, failng to use any inflation adjustment is failing to provide a fair apples-to-apples comparison. In my opinion, it's by far the biggest failing in economic reporting - and for decades. It can easily lead to many false conclusions. Ah, yes you are correct. My apologies. I must have been thinking of another data series. I'll agree, but I didn't feel like adjusting both data sets. I was feeling lazy. Plus, it seems that every time an inflation-adjusted series is discussed, the conversation ultimately devolves into "you're deflating too much!" vs "you're not deflating enough!" and I really didn't want to take it in that direction. You may have noticed that I've tended to downplay my own CPPI lately, in favor of the general point of just plain inflation adjusting. It does make a big difference to use CPPI and I believe presents a much more accurate picture, but starting off by just making an attempt to go with apples-to-apples is better than nuttin'. 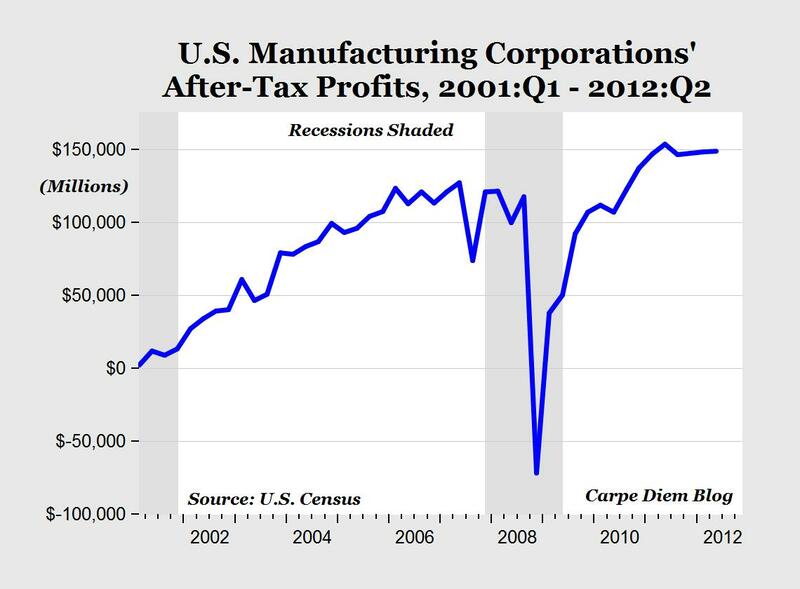 This provides evidence of an industry that has not only made a complete recovery from the 2007-2009 recession, but shows that U.S. manufacturers as a group are now actually significantly more profitable than before the recession. Or evidence that companies took the opportunity to write down many assets so that they could report much higher numbers later down the road. When the government steps in and allows GM to stiff bondholders it is hard to get excited when GM reports higher profits because it does not have to pay those bondholders back. What is a more realistic indicator is the taxes that the companies are paying today versus what they paid before the crisis. Jon Murphy, have you seen data showing that U.S. manufacturers are sitting on cash. I'm not disagreeing with you, but I was surprised to read that. I know that PG used its profits to buyback shares. 3M has been acquiring companies. I'm vacationing without my computer, so research is difficult. I'll look into the cash situation of other large manufacturers later this week. But not if you have already done so. I have a chart somewhere showing business cash reserves (it might be an FRB chart). I will see if I can find it for you. What does sitting on cash really mean? It is not as if the companies are keeping the cash in a basement somewhere. The money they earned is on deposit and has been lent out to others or used to buy treasuries. If they decide to use it the cash will have to be taken back from those that borrowed it or from other depositors. That would mean money flowing out of the bond and commercial paper markets. And that has consequences. To hold you over, here is a chart on business cash reserves. It's a tad dated and from the Center on Budget and Policy Priorities, but I will vouch for its accuracy. "I'm vacationing without my computer, so research is difficult. I'll look into the cash situation of other large manufacturers later this week. But not if you have already done so."